Here is a talbe of all 5 Mycenaean vowels & all of the basic syllabograms we have learned at Levels 1 & 2. There remain only a few more basic syllabograms, which we will address at the beginning of Level 3 (INTERMEDIATE), starting this month. Students who have already learned the basic characters at Levels 1 & 2 should not proceed to Level 3 until they have thoroughly mastered all the characters at Levels 1 & 2 . I am more than willing to tailor the lessons to each student’s individual needs and learning pace. Lord knows, Linear B is hard enough to learn. I know! I had to learn it myself, and it took me months before I could finally recognize all the characters on sight. Here is the table. Have fun figuriing out what each syllabogram means. But do take your time. Go over the table until you are quite sure you have mastered all of the characters. Good luck! I am reading the information on this page with growing enthousiasm. I am a student of History in Utrecht (Netherlands) and am currently undertaking classes in classical archaeology. Unfortunately my university does not have any courses where Lineair B is the sole object of study. I would very much like to learn as much as I can about this fascinating script. I read in your post above that you are actually teaching advanced courses now, but that the option remains to learn on a starter level. I don’t know if this still applies, but I am very driven to learn about this topic, and would very much like some advice, and maybe some literature you would reccomend. Thank you in advance, for whatever information you are able to provide! sure having a lot of fun together. I tailor the course to the needs of each individual student. following information, so that I can determine where you and I can start. such as Cypriot and Cretan Greek? 3. How much Linear B do you already know? i.e. the basic characters? + homophones? 4. Have you been able to translate any tablets? for me. I have exercises already prepared for Levels 1 & 2. My approach to teaching Linear B is entirely novel. No one has done this before. Ventris true credit, in so far as I am capable of doing so. More on this later. I am looking forward to hearing from you statim. on the life of Michael Ventris, and his amazing achievement in the decipherment of Linear B.
and then running through the next 6 videos in sequence, as explained in the post. Hi Rita! I just listened to the entire BBC broadcast on Michael Ventris, and it was stunning! bcc. 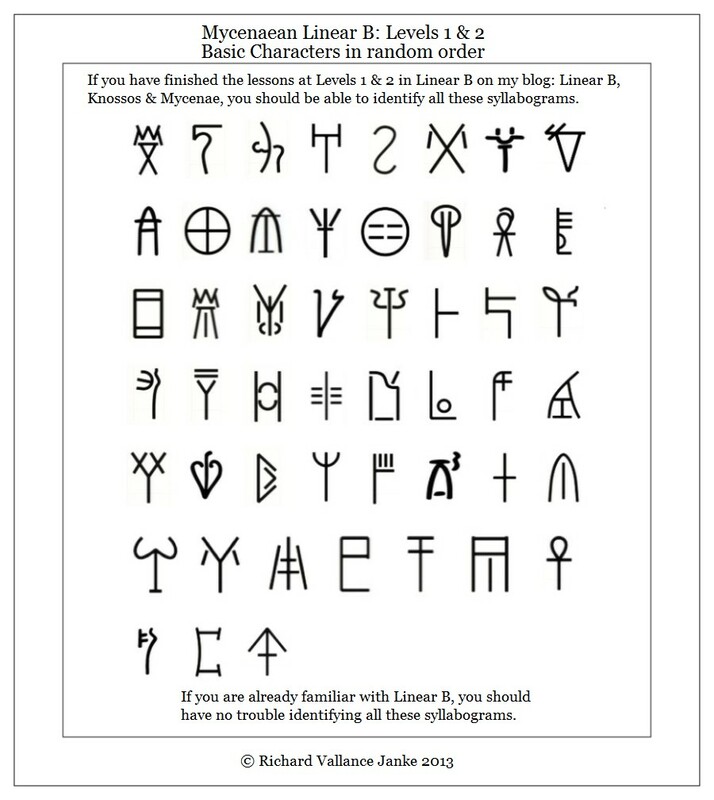 my other Linear B contacts, bloggers, students and and researchers into Linear B. This is what I had to say on UTube…. Michael Ventris was a true genius, whom I hugely﻿ admire. So I started my own Blog, Linear B, Knossos & Mycenae (WordPress) and my PINTEREST Board, Mycenaean Linear B: Progressive Grammar & Vocabulary, where﻿ I am approaching the study of Linear B from an entirely new perspective. SO EXCITING! Thank you so much, Rita, for referencing my work Ventris’ dark life is a great revelation to me. I AM SO GRATEFUL to you for this! understands me in this regard. for the trees. This too I share with Ventris. The video deeply moved me, and one point to tears. I have not heard from you since you last posted your comment about your enthusiasm for this Blog. I sincerely hope that I did not offend you by implying or explicitly suggesting that you should learn Linear B from ME, since after all, if you are an adept linguist, which I am assuming you ARE, you can quite swiftly learn it yourself (thak you very much!). If I have done so, please let me know, with my present apologies. I am in need of as much feedback and critical appraisal of my views on Linear B, as well as on my novel approach to Mycenaean Linear B grammar in my new theory of Progressive Mycenaean Linear B, Grammar and Vocabulary, which I am now in the process of developing, step by step, however gradually. As I advance my premises, it will soon enough become quite clear to other researchers in the field of Linear B where I am taking this theory, and why…. mainly to honour the memory of Michael Ventris, whose outstanding genius unlocked the key of this amazing syllabary, and of Prof. John Chadwick, his sidekick, who assisted him every step of the way. So I sincerely hope that you can assist me in my contined endeavours, and even, if you like, actively contribute to the elucidation of the theory itself, much as John Chadwick so greatly contributed to Michael Ventris’ amazing achievement during his brief life, and for many years after his tragic death in an automobile accident at the age of 34 in 1956 (as I recall). I look forward to your reply with anticipation. Hello there, Jen. I am pleased to meet you. If you wish to learn Linear B, I would be happy to be your instructor. from there, gradually increasing the difficulty, you will find you will learn Linear B in an orderly fashion. approach to learning Linear B is entirely novel, never before utilized. Rita likes my approach a lot. So anyway, if you would like to come on board, just let me know. lessons which Rita and I have worked out together, and I can start you off from square 1. Hello Jen! I am delighted you find our blog fascinating. There is plenty more to come! Our blog is based on the premise that it is both theoretically and practically possible to RECONSTRUCT a good deal of Mycenaean Grammar and Vocabulary NOT attested on any extant Linear B Tablets by extrapolating from the grammatical forms and vocabulary which are presented on the tablets. I will be explaining and fully illustrating my new theory step by step, with plenty of supporting examples of new grammatical paradigms and derivative vocabulary over the next 2 years. So keep posted. Feel free to ask questions, comment or offer suggestions or criticisms at any time.